When I was about 10 years old, I decided it was time to graduate from the Scholastic Reader-approved books of my youth to what I determined was meatier, more adult fare. I checked out a book from the library about World War II—it may well have been one of those Time-Life overviews of the war that doubtlessly make serious historians cringe. But for a 10-year-old it was just the sort of stuff to spark an interest in history that continues to this day. The 10-year-olds of 2012 have more sophisticated tools at their disposal in the form of Apple’s iPad. And that’s given developers a chance to use the iPad’s touch interface and multimedia support to make history come alive in ways that few people probably imagined back in 1982. I’ve recently spent some time with a pair of apps—World War II Interactive and Timeline World War 2—that take the same information about the war that I pored over decades ago and present it in an eye-popping new fashion. Both apps are worthwhile downloads for history buffs, particularly students, but one of them in particular does a standout job of putting its own stamp on the story of the conflict. World War II Interactive from Internet Design Zone offers a well-organized blend of text, photos, maps, and multimedia that together provide a solid overview of the conflict. The app splits up the story of World War II into nine sections, with chapters that focus on the events leading up to the war and the aftermath—the sort of valuable contextual details that sometimes get short shrift in apps like this. Background Information: Though it focuses on the war years, World War II Interactive includes a chapter on the build-up to the war as well as a section on World War II’s aftermath. Within each section, you’ll find articles on specific events. The 1943 section, for example, lets you read up on everything from the Tunisia campaign to the invasion of Sicily to American advances in the Pacific theater. The articles are fairly compact, but they’re augmented with tappable links and summary boxes for a good recap of events. 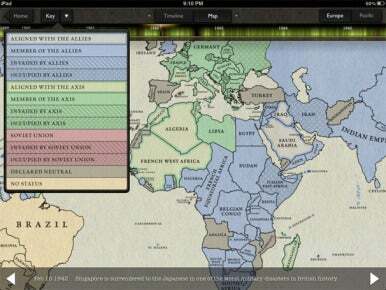 In addition, each section provides a swipeable timeline—again, with tappable links to more content—and a basic map showing what territories were held by the Axis and Allied nations at the end of the selected year. A multimedia section offers photo features on everything from propaganda posters to images and information on the tanks used in battle. The app also includes videos, mostly culled from old newsreel footage. Many of these clips are disappointingly short—10 to 30 seconds—but a few, such as those detailing the second battle of El Alamein or the D-Day landings, run for a couple minutes. 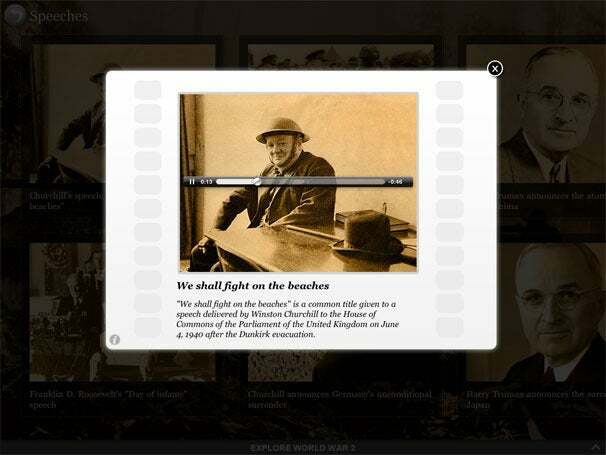 In addition, World War II Interactive features clips from memorable speeches, though only American and English ones are included. Churchill, Roosevelt, Truman, and Eisenhower are all well-represented here; Charles de Gaulle and his Appeal of 18 June speech is not. Omitting transcripts of the featured speeches also seems like a glaring oversight. Speaking Engagement: World War II interactive includes clips from half-a-dozen noteworthy speeches, including this address from Winston Churchill. Ballista Media’s Timeline World War 2 doesn’t offer the display options of World War II Interactive. 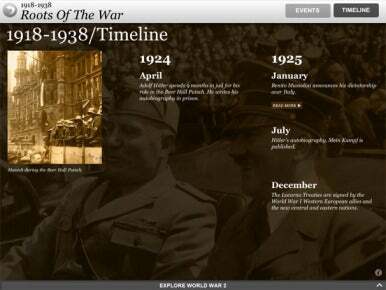 Like the name says, Timeline World War 2 shows off its information about the war—short dispatches, photos, maps, and videos—in a scrolling timeline spanning from 1939 and 1945. And it is absolutely gorgeous. As you might guess, Ballista has designed Timeline World War 2 to be a chronological account of the war. (The app’s home page even features an On This Day box that highlights an event occurring on the date you’re using the app.) The main timeline calls out major events—Eisenhower taking command of U.S. forces in Europe, the Marines’ assault on Guadalcanal, and the Soviet counterattack in Stalingrad highlight the middle of 1942, for example—but other events float in the background. Tapping on any event zooms you into the day-by-day view, which provides more detail. 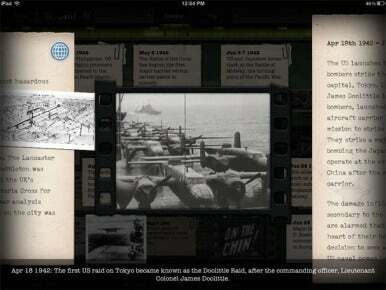 Words and Pictures: Timeline World War 2 blends text, photos, and newsreel footage to tell the war’s story. In a particularly impressive touch, you can swap out the original audio from historic newsreels with updated narration from Robert MacNeil. The articles in Timeline World War 2 aren’t as long as those in World War II Interactive, but there are more of them; the same holds true for photos and newsreel footage. And Timeline does a better job of putting the information in context. A tappable map icon in each entry shows you where the events took place, so you can get a general sense of where places like Dunkirk and the Ardennes are. (Those pins are dropped on a global map depicting the conflict, which is not as detailed as it should be. Fortunately, other maps in the app showing battles and troop advances offer a more detailed view.) Some of the included videos allow you to swap in new narration from newsman Robert MacNeil over the original audio. Again, this lends the content included in Timeline World War 2 eight decades of perspective you won’t get by just including the original footage. In addition to its timeline view, Timeline World War 2 also features a map overview, depicting the territories held by the Axis and Allies. Adjust the slide at the top, and you can see how that territory changes as the war progresses. It’s a neat feature. Axis and Allies: Timeline World War 2’s main map shows you the shifting war front as time progresses. Timeline World War 2 is not without its flaws, chief among them the need for an Internet connection to view video content. For students who access the app in a classroom or users with a cellular-enabled iPad, that won’t really be an issue. But if you’ve got a Wi-Fi-only model and you want to do a little reading up on World War II when you’re out and about, you may have to make do without the video component. It’s a trade-off Ballista likely made to keep the app’s file-size manageable, but it’s likely to rankle some users. I also wish there was a way to bookmark starting and stopping points or to jump to a specific year from the app’s home page: Timeline World War 2 forces you to start with the invasion of Poland in 1939 anytime you enter the timeline. The 10-year-old me would have enjoyed both World War II Interactive and Timeline World War 2. Both apps make great use of the iPad interface to present a lot of facts and figures about World War II in a compelling and engaging way. But the 40-year-old me appreciates the effort put into Timeline World War 2 a bit more. Features like a scrollable map, updated audio for newsreel footage, and day-by-day layout of information show an effort to do more than just repackage freely available content and to instead create an app that really stands apart.